It will not be enough to play defense. As millions ask “what will it take to stop Trump?”, a discussion about strike action has been rapidly developing. The “chaos” we created at the nation’s airports gives a hint of what’s possible. In spite of the protests being rapidly pulled together protesters won the immediate release of detained immigrants and even pushed sections of big business into coming out against Trump and his Muslim ban. But we need to think deeply about where our strength lies and how to create disruption on an even greater scale. Working people have enormous potential power to shut down the profits of big business by taking action in their workplaces like slowdowns, sickouts, and strikes. The Trump ascendancy creates a new context for addressing long-standing tensions between organized labor and the environmental movement, between workers’ job concerns and everyone’s need to protect the climate. Trump and his congressional Republican allies intend to exploit these tensions to the max. But their threat to workers, the earth’s climate, and society as a whole make cooperation against them imperative for both organized labor and the climate protection movement. Forging a force that can effectively counter Trumpism requires change that will involve tension within each movement as well as between them, but that may be necessary if either is to have a future. The alternative is most likely decimation of both movements and of everything they are fighting for. Ever since taking power, the Trump administration has made clear it intends to wage war on the environment. It’s given the green light to both the Dakota Access and Keystone pipelines and geared up to wipe away long-standing protections that keep our air and water safe. Its mission is clear: Eliminate any obstacle that stands in the way of fossil fuel companies. Yet I refuse to see this moment as a crisis. I see it as an opportunity to bring together people from different backgrounds and different areas of the country to start building a truly national movement to defend our environment. And the People’s Climate March, happening on April 29 in Washington, D.C., is where it will take off. Calls for general strikes reflect the extraordinary times we live in. The Left should join in organizing them, not dismiss them. 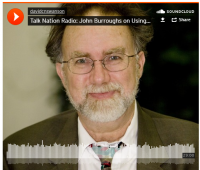 John Burroughs is Executive Director, Lawyers Committee on Nuclear Policy (www.lcnp.org), based in New York City. He represents LCNP in Nuclear Non-Proliferation Treaty review proceedings, the United Nations, and other international forums. He was a member of the Marshall Islands international legal team in its nuclear disarmament cases in the International Court of Justice. He’s the author of numerous publications related to nuclear weapons including contributing to a report called The Climate-Nuclear Nexus, which we discuss.